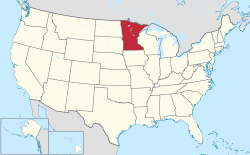 Minnesota is a state located in the Midwestern United States. According to the 2010 United States Census, Minnesota is the 22nd most populous state with 5,519,952 inhabitants but the 14th largest by land area spanning 79,626.74 square miles (206,232.3 km2) of land. Minnesota is divided into 87 counties and contains 853 incorporated cities, with populations ranging from 422,331 (Minneapolis to Saint Paul. The Twin Cities metro areas. Saint Paul and Minneapolis Have more Contract for deed homes than any other cities in Minnesota. Browse Contract for deed Saint Paul below and Minneapolis Contract for deeds. 651-334-8312 for quicker response call or email us thank you.